Fluorescent light is the most common type of electrical light used in the United States. It is estimated that there are 1.5 billion fluorescent lamps in use nationwide, mostly in commercial settings such offices, factories, stores, and schools. Fluorescent lighting is popular due to its high efficiency: it produces four to six times more light than an incandescent lamp consuming the same electrical power. Luminescence is the term used to describe the process in which light is produced by a means other than heating (incandescence refers to the production of light from heat). Fluorescence is luminescence in which light of a visible color is emitted from a substance that is stimulated or excited by light or other forms of electromagnetic radiation (radiation that has properties of both an electric and magnetic wave and that travels through a vacuum with the speed of light) or by certain other means. Once the stimulation stops, however, the light emitted by the stimulated substance lasts no more than about 10 nanoseconds (10 billionths of a second). Humans observed fluorescence in certain rocks and other substances for hundreds of years before fully understanding its nature. In 1852, English mathematician and physicist George Gabriel Stokes (1819–1903) finally named and explained the phenomena (he named it after fluorite, a strongly fluorescent mineral). Stokes discovered that fluorescence can be induced or brought about in certain substances by stimulating them with ultraviolet light (ultraviolet radiation is electromagnetic radiation of a wavelength just shorter than the violet end of the visible light spectrum and thus with higher energy than visible light). From his discovery, he formulated Stoke's law, which states that in fluorescence, the wavelength of the emitted or fluorescent light is always longer than that of the stimulating radiation. Even though Stokes uncovered the science behind fluorescence, fluorescent lamps were not commercially produced until 1938. Since then, improvements have been made in all aspects of the lamp, but the basic principle has remained the same. Fluorescence: Luminescence (glowing) that stops within 10 nanoseconds after an energy source has been removed. Incandesacence: Glowing due to heat. Ultraviolet radiation: Electromagnetic radiation (energy) of a wavelength just shorter than the violet (shortest wavelength) end of the visible light spectrum and thus with higher energy than visible light. A fluorescent lamp is formed from a sealed, hollow glass tube that is straight, although other shapes also can be used. 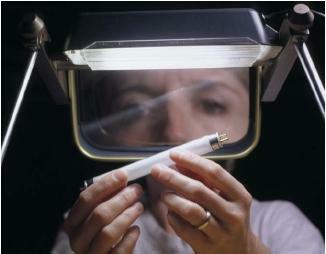 The tube contains a low-pressure mixture of argon gas and mercury vapor. Electrodes are located at either end of the tube, which has a coating of an inorganic phosphor on its inside surface (a phosphor is a material that absorbs energy over some period of time, then gives off light for a longer period). When activated, the electrodes discharge a stream of electrons that flow between them through the gas mixture. The electrons interact with the mercury vapor atoms floating in the gas mixture, exciting them. As the mercury atoms return to an unexcited state, they release photons of ultraviolet light. These ultraviolet photons then collide with the phosphor on the inside surface of the tube, and the phosphor emits visible photons—it fluoresces to create light. When the lamp is turned off, the phosphor stops fluorescing. The color of the emitted light is determined by the chemical compounds used in the phosphor. Most compounds produce what is perceived as white light. A fluorescent lamp produces less heat than an incandescent one. Thus, it runs cooler for the same effective light output. Fluorescent bulbs also last much longer: 10,000 to 20,000 hours versus 1,000 hours for a typical incandescent bulb. The lifetime of a fluorescent lamp is limited primarily by the phosphor and by the electron-emitting material on the electrodes. Over time, frequent on-off cycles begin to erode both. The induction lamp, a commercial version of which was introduced by the General Electric Company in 1994, contains no electrodes, and the discharge current is induced by a radio-frequency discharge. Since there is no erosion problem, the induction lamp has the capability of lasting for up to 60,000 hours, many times longer than standard fluorescent lamps. i make a project for constructing fluroscent plasma lamp , so pls give me information. Powering one from low voltage DC like 12 volts, can be done by creating an Armstrong type oscillator circuit with an a frequency in the LF or VLF frequency range and stepping up the voltage to around 2000 volts through a ferrite core transformer.